These bags are worked flat using bead knitting techniques described in the pattern. Necklaces can be beaded on wire or I-cord and Japanese braiding can be done with DMC. Three designs in one pattern: Loopy Diagonal (blue), All-A-Flutter (maroon), Dazzler (Ivory). Those new to bead knitting are encouraged to try the Dazzler Bag first. 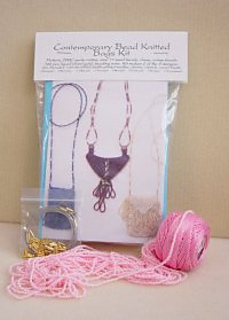 Instructions for transferring seed beads to thread also included. Kits available from FiberSpace. Call FiberSpace, 877-467-0382, for more information.